BARbucks by designLAB, Boston – Coffee served bartender style like at a bar for people that want a more social solo experience. This is how coffee is served in Italian espresso bars. designLAB also presents AUTObucks, the equivalent of the self check-out at the supermarket. Drink/Think THIN, by Studio Works, Los Angeles and Beijing – This is definitely something you’d expect from L.A., with the idea of thin stretched out coffee bar occupying the edge of a building and the edge of a sidewalk, providing a duality of being in the street yet in the building. 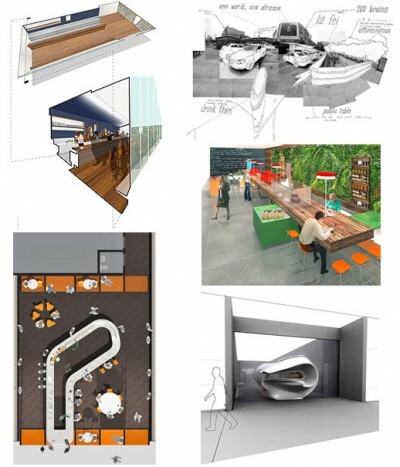 Modular Community Kitchen, by Studios Architecture, New York – The coffeehouse as workplace, focused on the 60′ long communal table. More on this in the next entry. Push-and-Pull Bar, by William E. Massie/Cranbrook Academy of Art, Bloomfield Hills, MI – Almost a perpendicular alternative to the THIN concept, a coffee bar protrudes out towards the sidewalk, providing a sort of take-out/outdoor service. The bar continues into the building for an indoor experience. *$, by Pentagram Architects, New York – So named to reflect a brand associated with simple, fast, efficient, universal, the focus is on coffee and only coffee via two modes – fast on the bar, or slow at the tables. Thanks to Braulio Agnese of Architect magazine for the reference and use of images.